Opre Roma! Happy International Roma Day! A few years back I wrote an blog post called The "G" Word: Honoring the Roma which was my first sojourn in talking about the Roma culture and our relationship to it as herbfolk. As a mix-d creature of Roma heritage, I've have found hope and frustration in the ensuing years as there has been an increase in organizing amongst Roma folk to stand up for our rights and a continuing rise of racism and misinformation against Roma, especially in Europe. If you're unfamiliar with Roma culture and want to learn more, I think the Open Society Foundation has some great resources for English speakers. The following video highlights some of the most pressing issues faced by Roma folk and ways that Roma folk are fighting for change for their communities. Today is also about celebrating Roma culture and it's easier to celebrate the beauty of a culture when you understand its origin story a bit better. The following video is a simple, funny, and informative look at the history of the Roma. 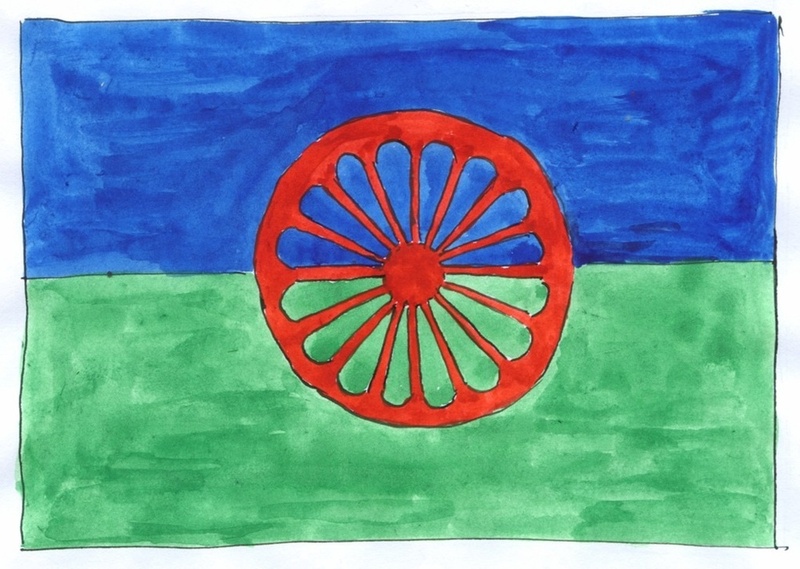 So Happy International Roma Day, clever ones! In the work of inclusivity and social justice I've learned many, many things but one of the most important that I've learned is to be kind - something that is so often missing from the conversation when we begin to talk about the Roma. I wish kindness to you and your communities and it is with kindness that I invite you to the table to learn more about the reality of Roma life and the gifts of our culture. Because to learn and know the so-called "other" is to know our own selves better, to release our projections of fear, and be more kind, more just, and more able to live with one another in peace. Today is International Roma Day which celebrates Romani culture and contribution to society as well as raising awareness of the ongoing issues that the Romani people face throughout the world. As herbalists, herb folks, herbal medicine users, and people who like Nettles, we have an opportunity to make our communities more inclusive, more kind, and more just by simply adjusting our language to honor a culture that many feel inspired by. The term “Gypsy” is a pejorative and offensive word used to describe the diverse population of people known as the Roma / Romani / Romany / Rroma, depending on local Roma dialect. While many folks on view “Gypsy” as just another descriptive term to be used to describe a situation, a person or to sell items it is important to recognize that words are the framework that hold together institutional racism. Words and their connotations are necessary tools of oppression, so they do hurt, they do matter, and they are worth questioning and hopefully dismantling. As herbalists, especially those who practice Western herbalism, we have a particular responsibility to honor cultures that have perserved herbal knowledge through the centuries and that we now use today. In my practice and devotional work with our plant kindred, I have watched how we become more like the plants we work with and the plants become more like us in turn. So when there is a plant that plays particular importance within a culture or a remedy that is associated with a certain people, I pay attention to both the stories of the plants and of the people they are so closely intwined with. There are many plants and remedies associated with Romani culture, from the mythic Queen of Hungary Water to "Gypsy" cold cures featuring Peppermint, Yarrow, and Elder, many herbalists have not only heard about these remedies, but make them as well. What's more is that there is so much romanticizing that goes on about Romani culture and the Roma themselves, that learning historical Romani herbal remedies can be a hard thing to do, especially since Romani culture is beautifully diverse. As a humyn creature of mixed ancestry, I am particularly invested in changing the ways we talk about, around, and over Roma peoples, like myself. In the United States there is not a lot of real information about Romani culture and it has been my experience that most Americans aren't even aware of the Roma of an actual ethnic group, so sometimes it can be harder for folks to understand that Gypsy is a pejorative word used passively as a form of ignorance and actively as a form of violence. For me, the foundation of changing language is wanting to more authentically describe the world and our experiences in it to better understand ourselves and each other. So if you use the word "Gypsy," I would ask for you to let it go, put it in the compost, allow it to decompose, be transformed, and fertilize your garden of knowledge resting in that noggin of yours. It's easy, honorable, and a whole lot of fun coming up with a new vocabulary to replaced outdated terms that no longer serve us. Interested in learning more? I recommend the following article by Professor Ian Hancock. He is of Romani descent, teaches at the University of Texas Austin, and writes about the history of the use of the word “Gypsy” and why it is a term that is offensive and oppressive to the Roma people. As a final note, I hope that any conversations that ensue from this post are from a place of compassion, willingness to learn, and understanding that words hold power so we should celebrate that gift and use them respectively.